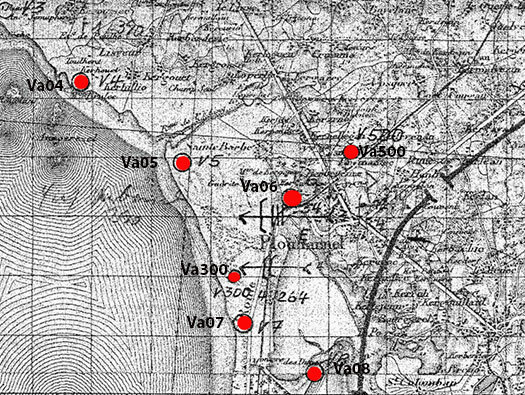 Square 3 showing where the Fire Control Post S487, Command Post, V229 and its Würzburg fire control radar and two Tobruks. This is where we are aiming to walk. 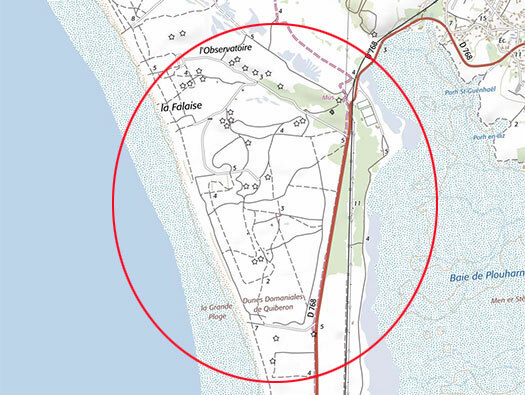 Site plan of Site No.2 the walk along the ridge. 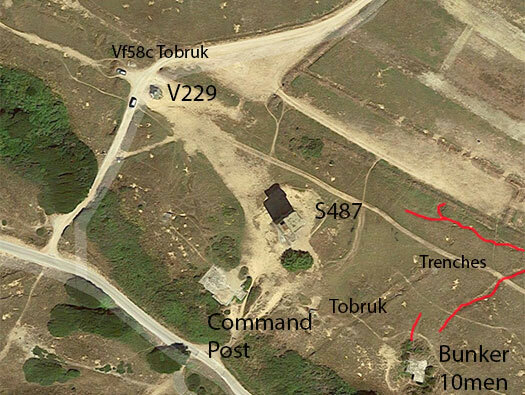 We now start at the Tobruk near the S487. Vf58c Tobruk the views across the site to Turm1. 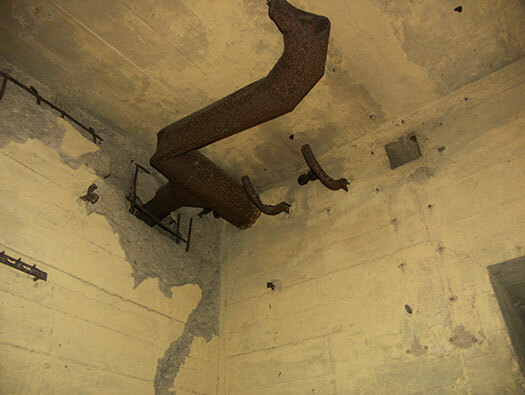 The steel bars sticking out of the walls was to hold camouflage nets to hide this monster but also to hide a shadow that the tower would form. From a shadow the RAF photo interpreters could have easily worked out its height and size. 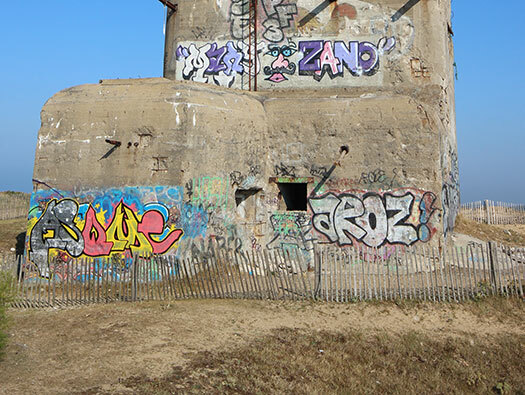 This is the S497 Fire Control Tower at Ro429 Karola, Ile de Ré showing how a camouflage net can be used on such a large tower. Plan of an S487 Fire Control Post ground floor. A plan of the observation all in ships steel plate. D-Day 6th June 1944 sees the allies land in Normandy, 15th August 1944 another landing in the South of France. 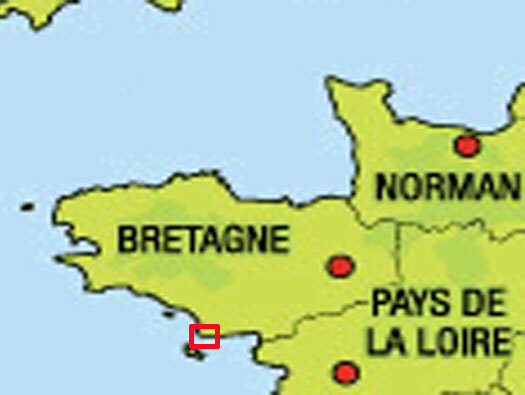 By August 1944 the Americans reach Vannes, the Germans decide to defend the area of the Lorient Pocket. With the help of the F.F.I. (French Forces of the Interior). They are used as extra Infantry and also observation. 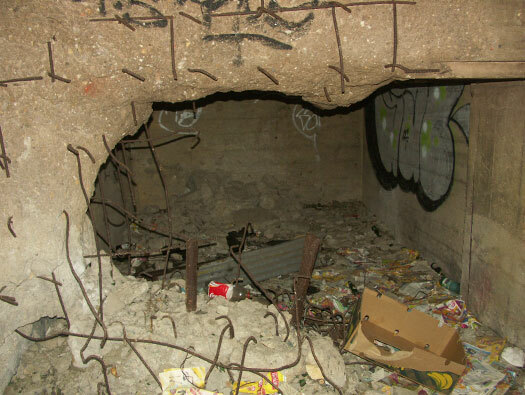 They use houses in Plouharnel to observe the batterie. The tree guns are lowered and turned towards the French. To load the guns they need to be lowered to -8°. The American artillery fire thousands of rounds onto Begot and the main picture is proof the damage done. 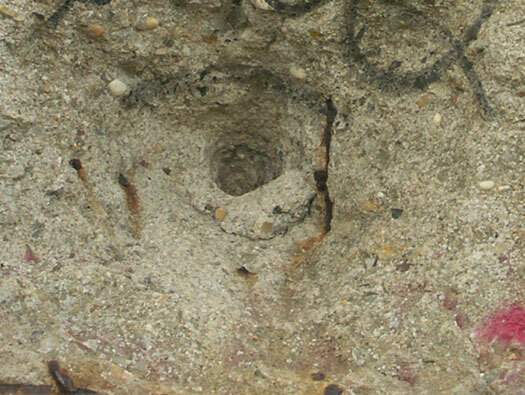 Rear machine gun defence embrasure. This looks like a Sherman 3'' armoured piercing shell. The entrance half bricked up and the Close combat defence embrasure. I had to climb over the wall to get in. The above door frame is for a thin steel sheet gas tight 19P7 door. 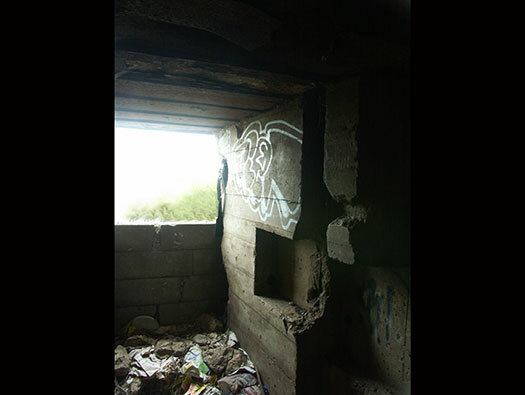 Mark on the wall showing where the steel stair case was. This may have been a heavier door a 434P01. Fresh air pipes to draw in air from outside, pass it through filters and then pump it out under pressure throughout the bunker. 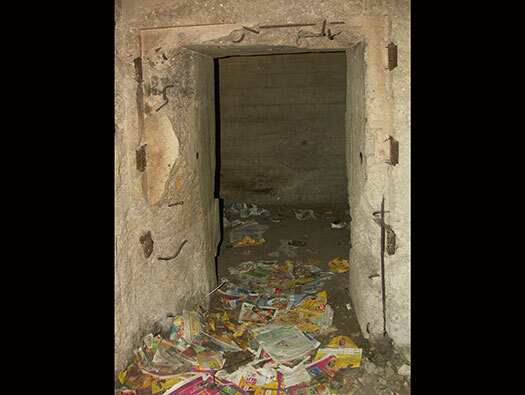 With the air inside at a slightly higher pressure, any gas outside could not get into the bunker. 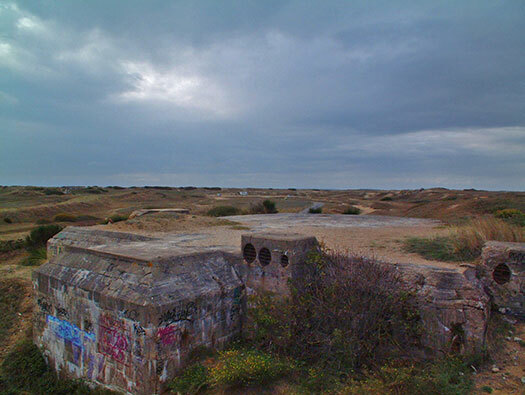 The only problem with over pressurising bunkers was that the air passing out of close combat defences and other apertures. It made it so cold that in some they almost froze in the winter. There would have been a room . 434PO1 door would be here, a heavily armoured door in two parts. Bottom and top. 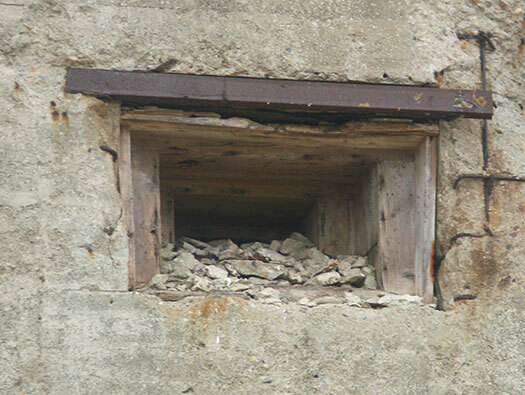 This meant that if rubble obstructed the opening of the door, the top can open and you can climb out. Something I have done many times entering and leaving bunkers. 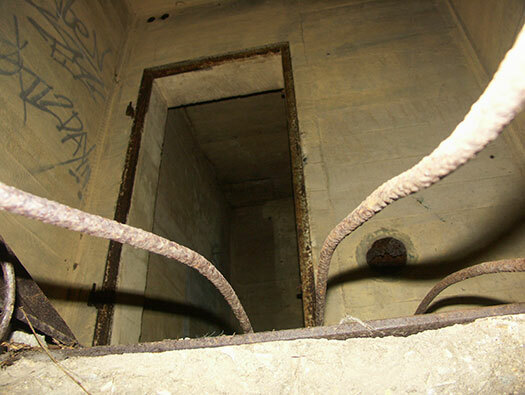 The top door has a slot with a sliding cover where you can look out at who wants to come in or stick a sub machine gun out and fire at any enemy trying to get in. Right - S487 Fire Control Post. All information coming from the Fire Control Tower would come into the Command Post. 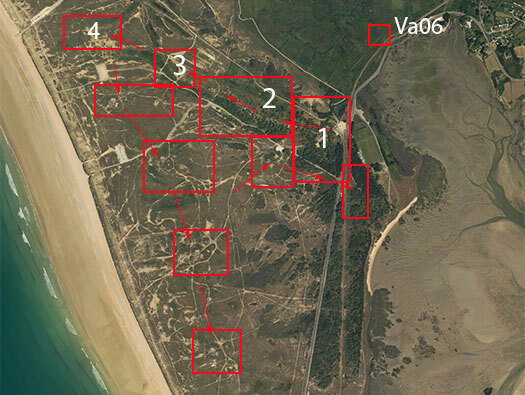 Then target information would be sent out to the four (on three were used) guns. The guns would then load their guns with the correct shell and powder charge (upping the powder charge means a greater range of the gun), then raising the barrel and turning the gun in the correct direction. The guns would then tell the CP that they were all ready and then the order would be sent from the CP to the guns. Powder charge entering the barrel.. 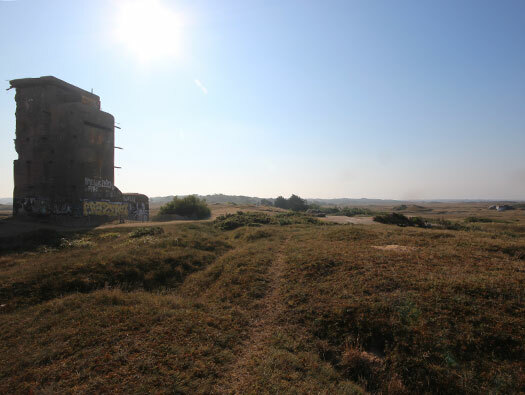 The lump sticking out is the entrance to the bunker on this side, the three vents are for the anti gas and probably a form of air conditioning. There is another vent to the right. The air vents I think 200mm and 100mm type. 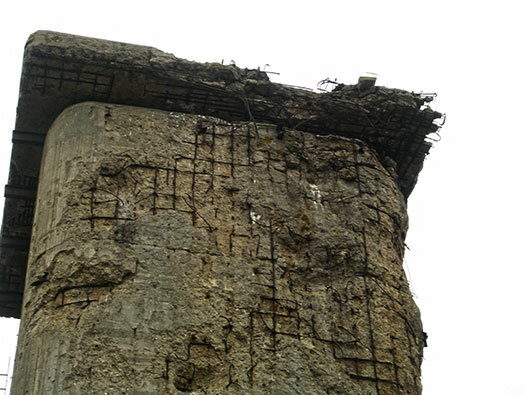 Base for a Würzburg See Riese Fu.MO214 fire control radar that was ordered for here but by September 1944 had not turned up. The radar to could track ships at sea and direct the fire of the guns just like the fire Control Tower would do but it could do it in the dark and in fog. 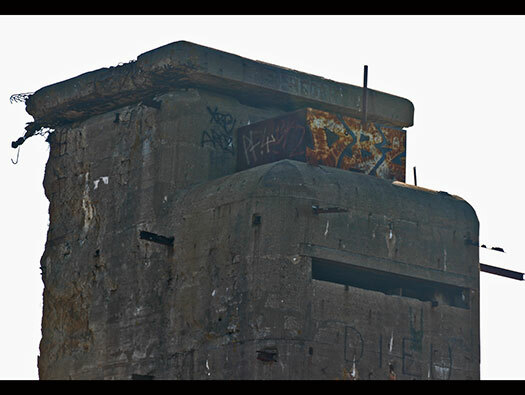 Since WW2 the V229 base has been used by the French as an armoured sentry post for the artillery range. Würzburg See Riese Fu.MO214 fire control radar.. Bits and pieces that we came across.